Provided photo Members of the Miami East-MVCTC FFA Safety Committee presented awards to Miami East Elementary second graders for their class winning farm safety posters. Members of the committee were, back row, left to right: Cody Niswonger, Lane Mergler, Brailyn Tarcea, Tyler Heckman, Daniel Baker, and Elizabeth Bair. Awards winners included, front, left to right, Beau Meyer, Cole Couser, Logan Howard, and Caitlin Howell. 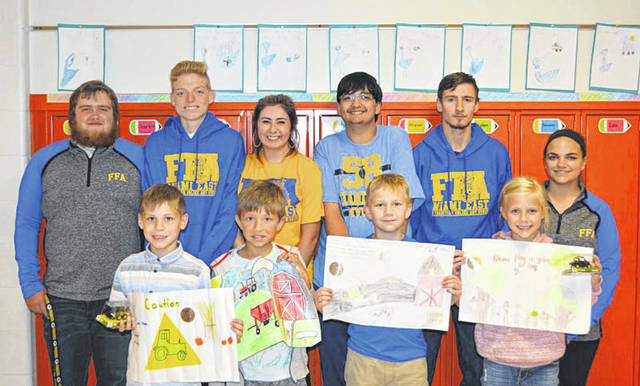 CASSTOWN — The Miami East-MVCTC FFA Chapter recently sponsored a farm safety poster contest at Miami East Elementary. The competition was coordinated by the Safety Committee and its members, Elizabeth Bair, Daniel Baker, Tyler Heckman, Lane Mergler, Cody Niswonger, and Brailyn Tarcea. Each student participating received a gift from the FFA Chapter, including candy and a pencil. The first place poster in each homeroom was also awarded special prize. https://www.dailycall.com/wp-content/uploads/sites/30/2018/09/web1_2018-Farm-Safety-Poster-Contest.jpgProvided photo Members of the Miami East-MVCTC FFA Safety Committee presented awards to Miami East Elementary second graders for their class winning farm safety posters. Members of the committee were, back row, left to right: Cody Niswonger, Lane Mergler, Brailyn Tarcea, Tyler Heckman, Daniel Baker, and Elizabeth Bair. Awards winners included, front, left to right, Beau Meyer, Cole Couser, Logan Howard, and Caitlin Howell.